How do you treat a book? Some people really "love" their books. They highlight, underline, circle passages and even write in the margins or use sticky notes to keep a record of their personal thoughts. How do you treat a book? Do you like it crispy clean? Or do you not mind keeping track of your personal thoughts in different ways? With books I read for study, like uni textbooks, I like to underline things in pencil and make notes in the margins. That's only for books I own of course, not library books. Other books like novels I try to take really good care of and never put them down open on the table or dog ear them. That being said, I love secondhand books and don't care if they're a bit marked up on creased when I buy them. It adds character. Now that I type that it sounds contradictory, but it has never felt that way to me. I bought a parenting book a while back that was full of really terrible advice and I felt compelled to cross bits out and add in my own ideas. It was a bit pointless since probably nobody else would read that copy but it amused me. I try to keep my books unscathed for as long as possible. I get upset when I see a new mark of crease that wasn't there before. Unfortunately, whenever I lend my books to my dad, what was once in very good condition, always comes back with creases, scratches, and the front cover no longer sitting flat. It really annoys me. Once, I had a complete Star Trek series of books in my cupboard. One day my ceiling started leaking badly, and all my books got warped and drenched. I was very sad at first, but after a while I realised that these were books that I no longer read or was interested in, so I got over it, and sent them to the charity shop. Bryony, thank you for sharing your "getting over" story. I had a collection of audio cassettes (a long long time ago) which were destroyed due to our basement being flooded in New Jersey. I cried, but again, I realized these were cassettes I didn't use. Now I have all my favourite songs in the palm of my hands. Only goes to show that when we lose our "things" that we are attached to, it's not the end of the world, even when it seems to be so. Sometimes these disasters can be a good thing because it helps/forces you to let go. I treat an old book with great care, having paid up to $270 per books for some in my collection! I am one who really loves her old books. However even in a newer book I do not write in the margins but use sticky notes in cook books. I love my books, especially the ones that touched my heart, taught me something new or left their mark on me. I keep them in excellent condition on my bookshelf and try not to let them get damaged. It doesn't always work, but I try. I do love my books. I do not write in them or highlight them or even put my name in them. 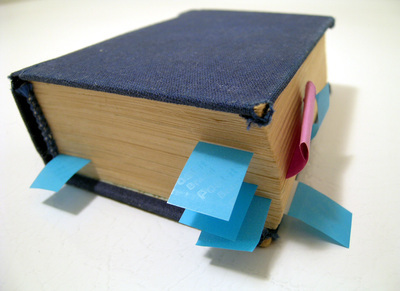 However, I do put small post-it tags on pages that I want to come back to. If I really like something and want to keep it close, I will photocopy it and paste it into my journal where I can write my thoughts freely. With the greatest respect. I love books! They were kept in pristine condition, when I had my 'Library' in my Lounge Room, at my original, beautiful house. Now they're all in packing cases, unfortunately! My 'day to day' books I buy, are kept in their purchase plastic bag to keep them clean. Get many books from Council Library, & get REALLY annoyed when I see a crease of turned down page! Lazy people! A bookmark can be anything from a Woolies' docket to a purchased beauty, so to me, there's NO excuse WHATSOEVER to turn down the page of a book! I try & 'iron' out the crease, if I can. It's very rare for me to write in a book. I much prefer to keep them unblemished! Would you pick a book or a magazine for...? What is the name of the book that you purchased most recently? Do you read self-help books? What is your favourite snack with a cuppa? Can friendships form in the animal kingdom? Do you drink water from public water fountains? Which colour is the base and which colour is the pattern?